The most significant discovery from the Apollo lunar landings is that the Earth and Moon shared a fiery early history, when a planetary body around the size of Mars slammed into the Earth to fling off vaporised rock that condensed to create the Moon. Such a catastrophic event reset the geochemistry of the Earth, and both it and the Moon likely had an early phase dominated by a deep ocean of magma. The evidence for a magma ocean comes mainly from the lunar highlands which are dominated by almost pure calcium plagioclase feldspar (the rock anorthosite), suggesting that this high-temperature, low-density silicate mineral crystallised and then floated to the surface of the Moon. Yet there is a great deal of evidence about the Moon that did not depend on people setting foot on its surface. For instance, detailed photographic records of the surface and extremely precise measurements of the surface elevation stem from cheaper orbital missions, including coverage of the unvisited far side of the Moon. The face of the Moon never seen from Earth has long been known to have one of the largest impact basins in the solar system, the South Pole – Aitken basin. 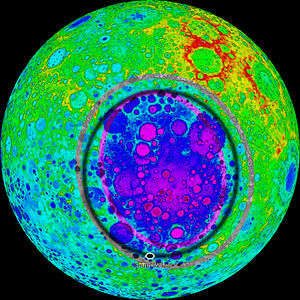 Analysis of the far side’s surface elevation data from the Lunar Orbiter Laser Altimeter (LOLA) also shows that it is significantly higher than the near side. It is also far more heavily cratered than the near side. Now there is a plausible explanation for the dichotomy: the Moon received another stupendous blow (Jutzi, M & Asphaug, E. 2011. Forming the lunar farside highlands by accretion of a companion moon. Nature, v. 476, p. 69-72). But how come that didn’t blast the Moon apart or re-melt it and allow it to re-shape to a near perfect sphere? The modelling study suggests that if the culprit slowly collided – around 2-3 km s-1 – it would have wrapped around the early Moon to plaster the surface with debris, nicely shown by the paper’s graphics. Such a ‘slow’ impact is only possible from a co-orbital companion moon, objects from outside the Earth-Moon system inevitably being accelerated by gravity to at least the equivalent of its escape velocity (about 11-12 km s-1). That exceeds the speed of sound through rock, leading at least to a very large hole, shock metamorphism and, with a massive body, to extensive melting (the energy would be ½ mv2) rather than the observed lunar far-side bulge. Jutzi and Asphaugs’s modelling comes up with a companion moon around 1200 km across, that may have formed from the same massive event that created the Moon itself. It could have accreted from the impact-induced vapour disc at a Trojan point in the lunar orbit, where gravitational forces balance to keep orbital objects apart. The gradual expansion of the lunar orbit in response to tidal forces – large in the early history of the Earth-Moon system – could have destabilised the balance so that the companion moon slowly drifted towards the Moon and eventual collision. One such modelling becomes closer to known reality, i.e. the far-side bulge, it gets more tempting to look for secondary possibilities. One of these the effect of such a ‘slow’ impact on the remaining magma ocean on the Moon. It may have blurted that by then deep molten layer to the side opposite the impact. That, the authors suggest, may be responsible for the geochemical peculiarities of the flood basalts that filled the much later lunar maria on the near side. 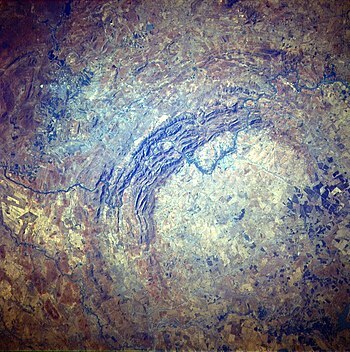 There are no signs of these KREEP basalt floors to large later craters on the far side, such as the Aitken basin, formed around 4.0 to 3.8 Ga ago at the same time as the near-side maria. A variety of new instruments orbit the Moon and more are planned, so this model presents a nice hypothesis for them to test: what is the betting that a robotic lander might eventually be sent to return samples from the enigmatic far side?